Only an awesome blogger, like Sew, Mama, Sew, can come up with a day like this. And crazy bloggers like me? We participate! Amy Butler Midwest Modern fabric stash! 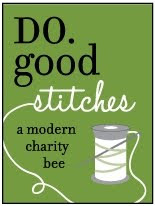 If you are here from Sew, Mama, Sew giveway link-up and are new here? I can't tell you how much it is killing me to give some more of this fabric away, but I always feel if I am going to offer something to you..it better be GOOD! I used some of these fabrics in little Hartley's quilt. I had planned on making one of these aprons again with it like these. But, I will be honest. I leave these lovely fabrics on my shelves because I want to save it for the most PERFECT project. That perfect project? What fabric line or pre-cut bundle do you have in your stash that you just can't seem to cut or start a project with yet? If you are feeling like you like one chance isn't enough? Become a new follower, or tell me you have always been following (leave a comment) for an extra entry. However, not necessary to win! Item will be shipped no later than Friday, December 14th. Hey, I'm the first comment! Means I totally won't win. Oh, well. I have a bunch of fabrics from a line that is so old I can't remember the name! I bought them to make some things for my kitchen, because it matches, and I keep putting it off! I think I tend to sew for others before myself. LOL! That is why you save your second entry for later (because I KNOW you are a follower)! Teehee!!! I I just can't cut into my Heather Ross far far away prints. I have so much fabric that I haven't cut into--not because I hate to but because I'm just too darn indecisive about what to make! 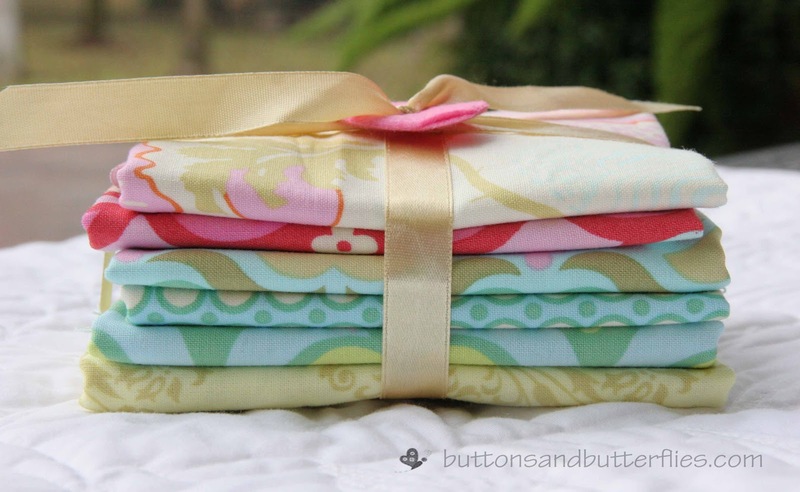 But the fabric that I hoard and treasure and don't take scissors to is my Amy Butler Belle stash. I'm a sucker for trolling the interwebs for that great coriander print and French Wallpaper! jjenni20 at gmail dot com -- it's nice to "meet" you! Thank you for the giveaway Heidi! I have Lark in my cupboard. Almost everyday I am tempted to buy more, because I am in love with it. (P.S. The other day I saw entry 1 win). I have some amy butler soul blossom -- I need to make myself a quilt! 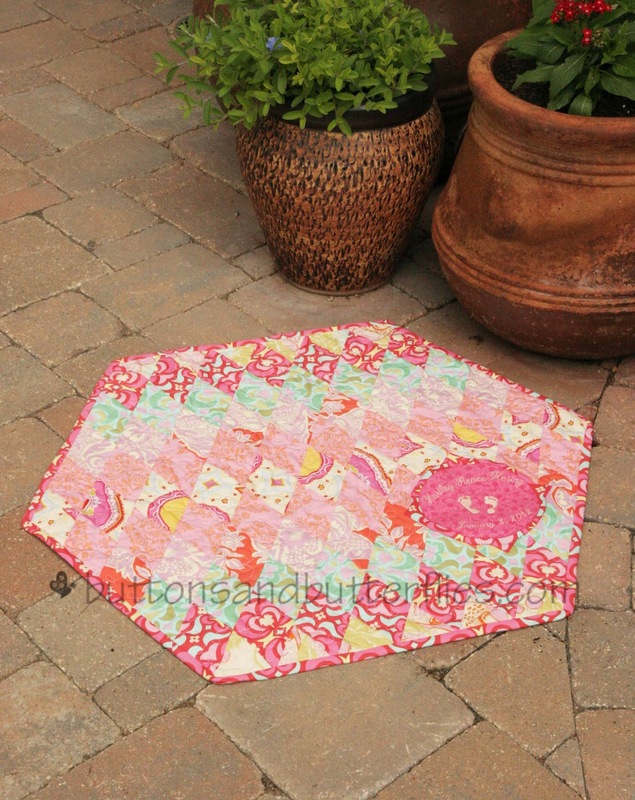 I can't quite bring myself to dig into my fat quarter stash of It's a Hoot by Momo for Moda. I really really love it. I bought some Kate Spain's Flurry for a Christmas project. Still trying to decide on the "perfect" pattern. Oh and I follow you via Facebook! I can't seem to cut into my Birds and the Bees by Tula Pink. I can't find the perfect project for all the fat quarters. I have Tina Givens Treetop Fancy...I just can't find that perfect project for it. My few Liberty fabrics. They seem too precious to cut, but I would love to one day get the courage to make something beautiful with them. I just need to figure out what first. modrona road- no it's not "special", just regular, I just love it! I have a big stack of Flower Sugar. I love Flower Sugar. I am just waiting for the perfect idea. I have some Field Study and some Summersville that I can't quite decide what to do with, it has to be perfect! Thanks for the give away! I have a bundle of Lotta Jansdotter's Echo that I love but have no clue on what to do with it just yet! Thank you Heidi! So far I have cut into everything...but bought more Lovely because I love it so much! I don't have any fabric that is like that. If you have it, use it, you can't take it with you. I love your cathedral quilt idea. Beautiful! I don't even know where to start as to the fabric I've set aside, but haven't the courage to use yet. It inspires me when I start a new project, but someday I'll need to dive in and sew! I've not been able to cut into my Field Study! I have this one fabric that is a beautiful brid fabric. I can't even remember the name of it now because I seriously bought it about 4 years ago. Still haven't used it because like you said I need the perfect project for it. :) Sending warm wishes and happy holidays to you guys. Thank you Heidi!! Thanks for the giveaway, hope you feel like you're recovering. I don't have any lines currently (as lines) but I do have a whole stash of Carol Bryer Fallert gradations fabrics that I have a really hard time bringing myself to cutting up. Eek! I have 5 fat quaters of a limited edition Liberty Print for the V&A that I still haven't managed to cut into. Shameless, and thanks for the chance to win, I know how hard it is to be giving these away! I have some bits of this and that that I really can't bring myself to cut! It seems I want to save a FQ of everything and I really don't know what for. Thank you for the giveaway! What lovely fabric. I have a tiny stash of vintage sheets that I can't bring myself to cut in to. I keep waiting for that "perfect project"
I have two yards of Katie Jump Rope that I will probably hang onto for way longer than is normal. 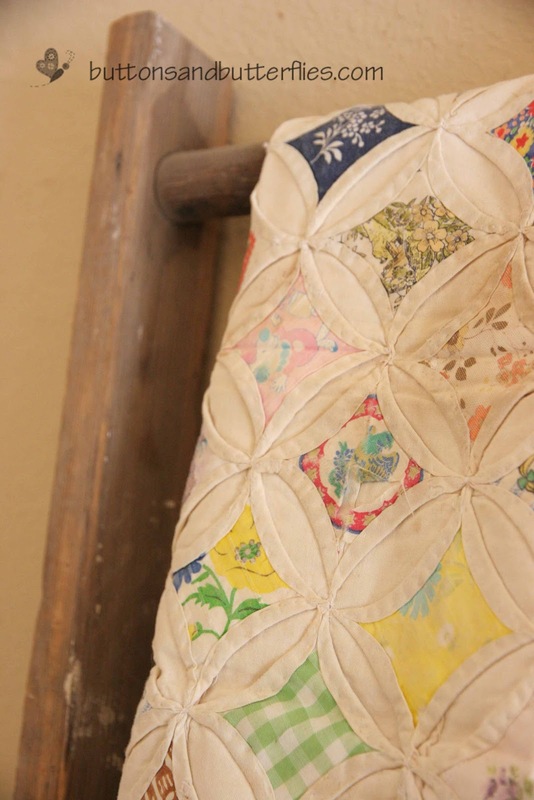 I have a yard of an Amy Butler´s fabric with flowers that I can´t decide what to do with! I have a fall charm pack that I was going to get around to, but now it is almost winter! I have a FQ bundle of good fortune by kate spain. Love it, need it to be a quilt ... but what pattern?! I can't cut Little Black Dress, I love it! I have a bundle of Lizzy House's Castle Peeps but I don't dare to cut into. Thanks! I have some Rouenarries by French General that I have been saving for the perfect project! i can't cut into my sarah jane mermaid in blossom yet... i saved up and waited ages to get it and am scared to ruin it. I have some Heather Bailey Nicey Jane I haven't cut yet. So pretty. I can't seem to cut into my innocent crush. It's still sitting in it's pretty little pile with parisville, just waiting. Oh and I am a new follower! I have some 1 yd cuts from FQS that I bought a while ago--they are mostly boys fabric and I have a hard time cutting into them!!! i have a fat quarter bundle of a line i got at a show several years ago -not sure what it is. i haven't found a way to show it off yet so it sits pretty in the stash. I have the gorgeous panel from Sentiments (Moda, Christmas fabric) that I want to make sure I don't spoil and also some cute Estonian linen. I have some Heidi Grace that I haven't cut into yet...still trying to figure out what to make with it! 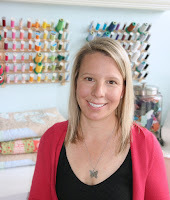 Love the Amy Butler fabrics...thanks for a chance to win your great giveaway! I am also a new follower of yours on facebook...thanks for a chance to win! I am already a follower. 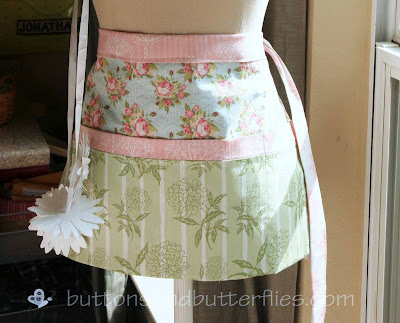 That is a beautiful apron. I have several bundles by French General that are waiting for the perfect project. I also have some fabric that I dyed myself that I can't seem to cut. How did you know I had fabric I can't seem to use in my stash?!!! I have Chocolat by 3 Sisters for a few years now. I have a drawer full of Indie. I want to make myself a quilt with it, but I just can't decide where to begin. So it sits! I don't tend to buy fabric unless I have a plan for it, so there really isn't anything in my stash that hasn't been cut into already. I have a fat quarter bundle from the Retro Forties line from Moda (2009? )...bought it ALL ! Just can't CUT it! Thanks for the chance! I have some Monaluna I've been hoarding for years. I have a nice wee bundle of Ghastlies that I absolutely love, but goodness knows what the perfect project will be! I have a fat quarter bundle of Vintage Modern that I just can't seem to use. I just love it too much! I've got a couple charm packs of Me and My Sisters (I think they are Amelia), in the drawer somewhere. But there are so many little boys in my life and no little girls, so they are just collecting dust! I have some birds and berries charm packs that I adore, but I can't decide what to make out of them yet. I have a few fabric lines that I am having trouble cutting into-they sit on my shelf. I even bought fabric just to make Christmas gifts out of and it kills me to cut into it. It is Nancy's Holiday Favorites by Benartex. I love it. Oh I cut into anything! My Hometown fat quarter bundle. Just...can't...cut it! My Far Far Away fabrics. I just can't bear to cut them for some reason. I haven't found the perfect plan for them yet I guess so there they sit. I don't know that I'll ever be able to cut them honestly! You know I stalk you! Wow, I don't have anything like that - I like to play with my fabric and usually know exactly what I want to use it for. I actually don't have any bundles or anything pre-cut, but I do have some vintage fabrics that really need to get put to some use. Actually I just cut into a charm pack recently that a friend bought me for my birthday earlier this year...my first Moda project! I'm so excited! I finally chose to make a hexagon bag I'd seen on AllPeopleQuilt.com with it and it's coming along nicely. I can't wait to finish and use it! I'm actually running low on fabric and could use some more. I have a Jelly Roll of Blitzen that I got for my birthday (IN JUNE) that I doubt is going to be a Christmas quilt by Christmas this year. Dangit! Let's see... I haven't been buying "awesome" fabric for very long, heh heh. I'd say my most precious uncuttable fabric right now are the Melody Miller typewriter prints. Hi Heidi! I hope this finds you healing and better each day. I wish I had more fabric in my stash to not cut into:) Mostly I have some cute kid prints that just don't want to be cut. I have a bunch of Neptune in my stash that I can't seem to cut. Thanks for the chance! I've been a follower for a while now! Hope Valley, I love that line so much I'm always waiting for the perfect project. Terrific giveaway, thanks for the chance to win! I have some liberty charm squares which I just can't decide what to do with! I have a few fabrics that I don't plan to use. Like NEVER! I just like to look at it, feel it, you know... thanks for the chance to win! Butterscotch and Roses. Thanks for the great giveaway! I have some Amy Butler fabric that I can't seem to cut up. I have some chicopee I need to find time to cut into. I have some RB Winter wonderland. I need to make myself a quilt! I bought a few metres of Valori Well's Wrnely Christmas but can't quite decide what to do with them so just keep getting them out to look at them. Need to come up with an idea soon, had better start searching some blogs for inspiration. I've been 'collecting' batiks and just can't seem to get near them with the rotary cutter!! I am hoarding a layer cake of Reunion by Sweetwater. I have some beautiful fabric with irises on it. I just can't make myself cut in to it. 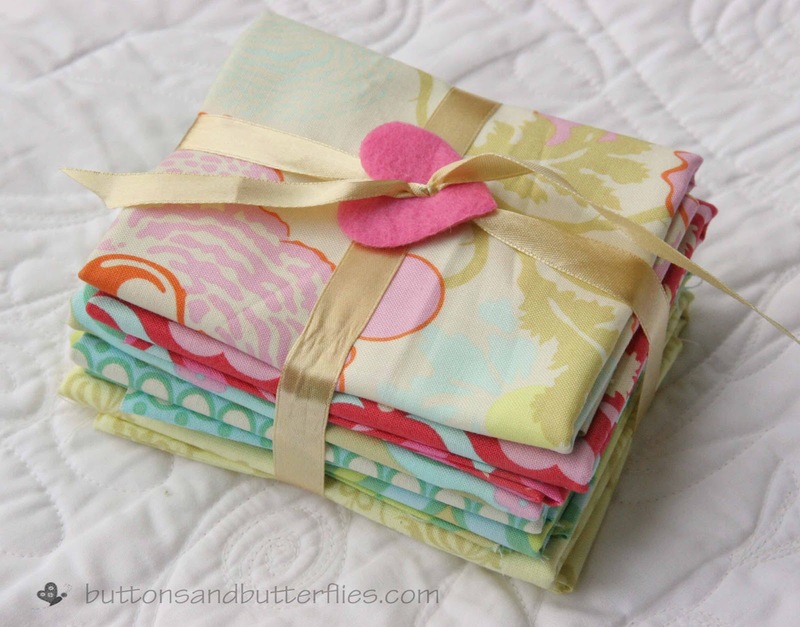 I love Amy Butler's fabric! I have a few of her Love line of fabrics. I have some Alexander Henry Mod Dot fabric that I've been saving for the perfect project. Thanks for the chance to win! I have a charm pack of Chicopee, it needs a perfect project! the last bits of my Terrain yardage! i just want to use it on something just right! I hoarded lots of Sweetwater Pure fabric for about 2 years and then finally cut into it. I use up all my fabrics. I have a fat quarter bundle of Crazy for Dots that I'm still fondling. Thanks for the chance to win. I just HAd to have field study and now it just sits. Moda, Tend the Earth. Had to have it, pet it occasionally. still haven't found the RIGHT project to use it on. LOL! Bought some Echo to make myself a new quilt but I can't seem to find the PERFECT pattern yet! I am a new follower. Hello! Love that fabric! The fabric in my stash that I can't seem to cut is Jessica Leavitt's Timber. Love it! I haven't cut into my flea market fancy yet! I'm not sure the name of the collection, but I have some older Heather Bailey that I just stare at. I wait for the perfect project, too...forever! Not a fabric collection per se but I have some vintage like 50-60's fabric that I got on EBay that I just can't use. Nothing seems "just right". I have some French General Lumiere de Noel that I just can't cut into! Thanks so much for participating in Giveaway Day and offering these lovely fabrics! I have some Bella fat quarters that I haven't cut into yet. Hopefully I can get to them in the new year! I haven't cut into my Vintage modern charm packs yet...trying to figure out the perfect pattern. No question: Hope Valley. I only just got the whole thing since the price started going down, and I'm still trying to decide what to do with it. I even have a Pinterest group for Hope Valley possibilities. What a nerd. Thanks for dipping into your precious stuff for us! It would have to be my Flea Market Fancy. It is so pretty. I have some super cute transportation fabric that I can't quite find the perfect project for. Thanks so much for the giveaway! I have some Heather Ross bicycle fabric that I just can't bring myself to cut into! Full Circle for Moda. Won it from a giveaway a few months ago and haven't found a project for it yet. I have a rainbow charm collection that just has to have the right plan, and I can't make a decision. Good Fortune and Terrain by Kate Spain. I love to admire them, just can't do it yet! It is really, really hard for me to cut into my Kaffe Fassett fabric; at one point I almost ran out and was going through serious withdrawal. I have such a hard time cutting into ANY fabric! I just want to collect it... But I have been really good lately at 'forcing' myself to cut into a lot fo my lovely fabric... because I did buy it in order to SEW with it! LOL! So fun to read about others who hate to cut into fabric! Love Amy Butler! Thanks for the chance to win! I have some chrysalis that I just can't seem to find that perfect project for. Lovely blog! I have some central park by Kate Spain that I don't dare cut into. Maybe next year! I have Kona New Colours still wrapped up in ribbon.. I have those amazing Anna Maria Horner fabrics ready for a quilt... but i am just so scared to cut into them! Oh I totally can't cut into my Soul Blossoms!!!! Cusco is sitting there awaiting the perfect project! Most of my Denyse Schmidt fabrics-especially the 1 yard bundle I bought. I keep buying more to cut up rather then cut it. I have some vintage Laura Ashley fabrics I inherited and can't bear to cut them up in case the result doesn't live up to my expectations. Mendocino from Heater Ross - too good looking to cut!! !